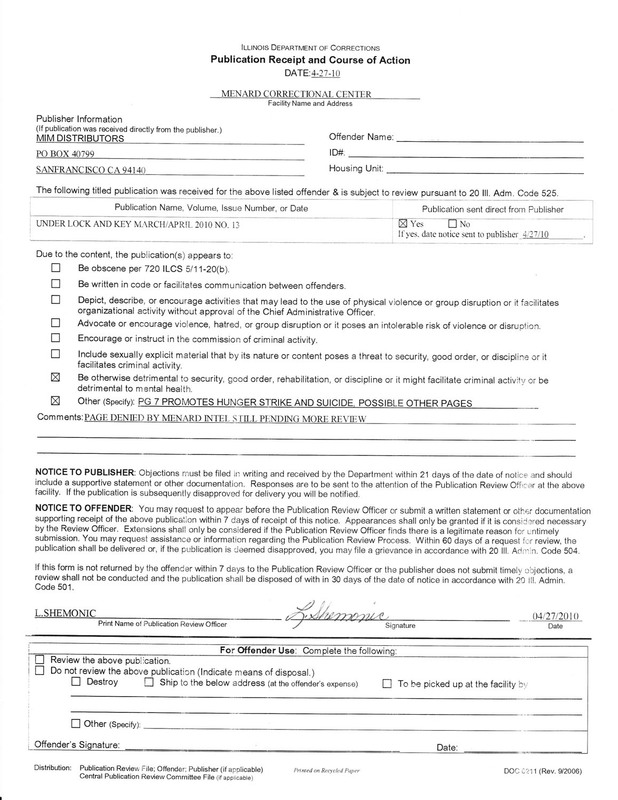 07/06/2010 ULK14 censored per DO 914.08 policy #1.1.1 "Riots/Work Stoppages/Resistance"
11/30/2010 Second Review upholds exclusion due to "depictions or descriptions that incite, air, or abet riots." 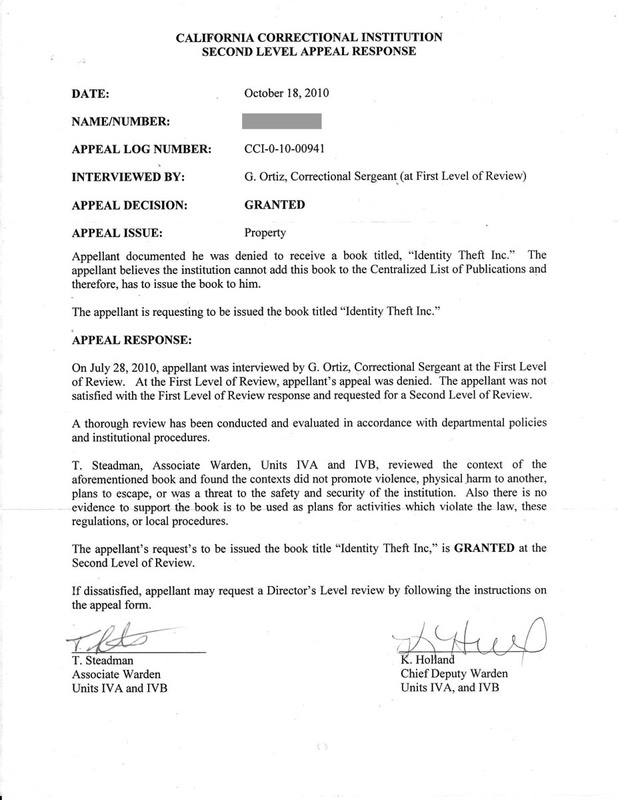 "The court required that an inmate be notified of the rejection of correspondence and that the author of the correspondence be allowed to protest the decision and secure review by a prison official other than the original censor." 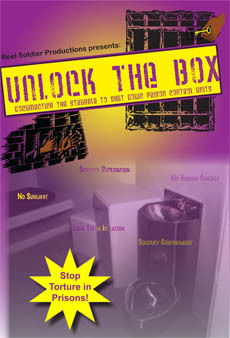 In September 2010 the newsletter Under Lock & Key issue 15 (July/August 2010) was denied from several prisoners held at Foothills CI. 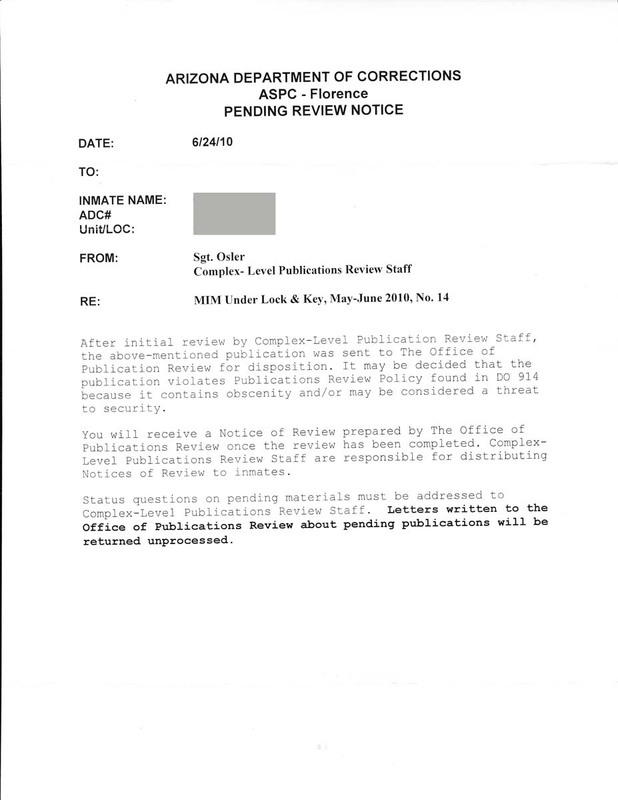 When returned to MIM Distributors, these newsletters were stamped "Contents Not Allowed" with no explanation as to why they were not allowed or who we should contact to appeal this decision. 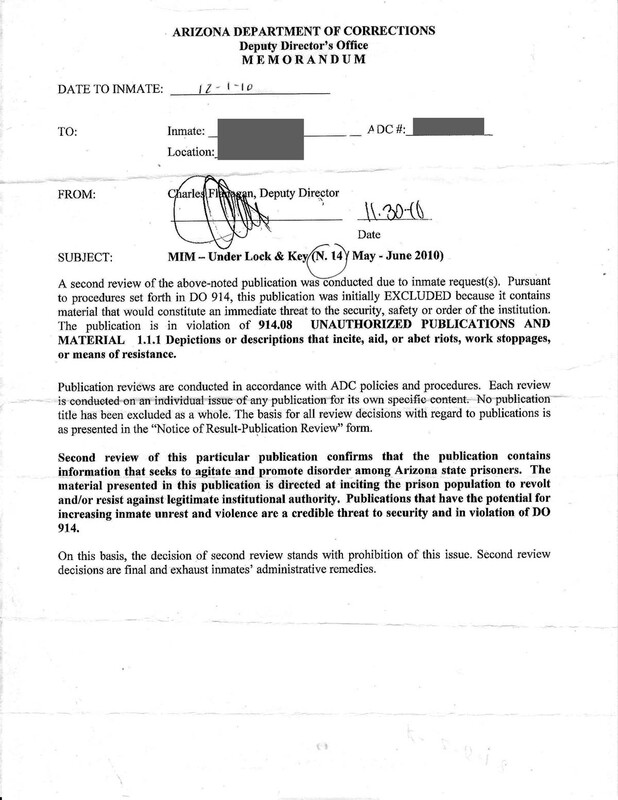 We received word from prisoners that Under Lock & Key 15 is being censored with no chance to appeal. How do you legitimize this illegal practice? 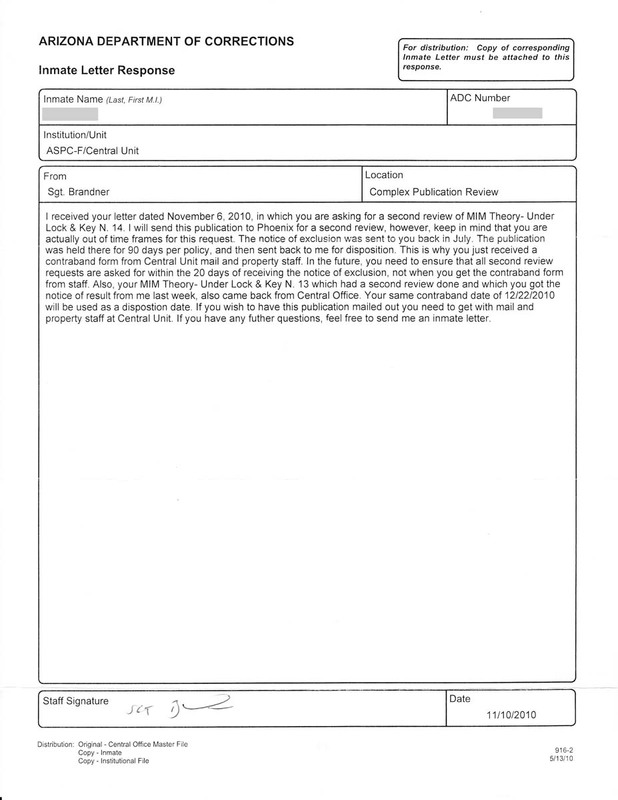 In addition to Under Lock & Key 15, other letters from MIM Distributors have been treated improperly by Foothills CI mailroom staff. 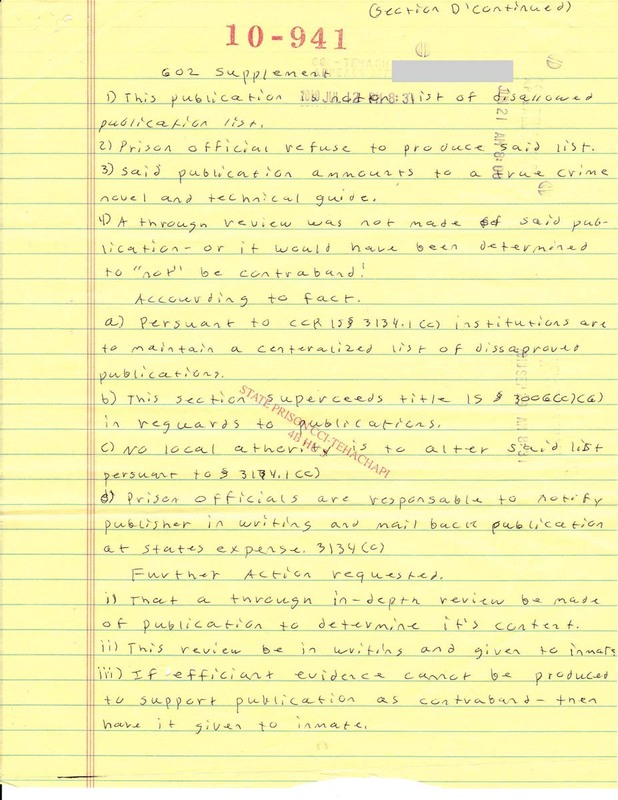 In July 2010, an introductory letter about the prisoner support organization MIM(Prisons) was returned for no reason, and there was no technical error on the part of MIM Distributors (such as an incorrect ID#). 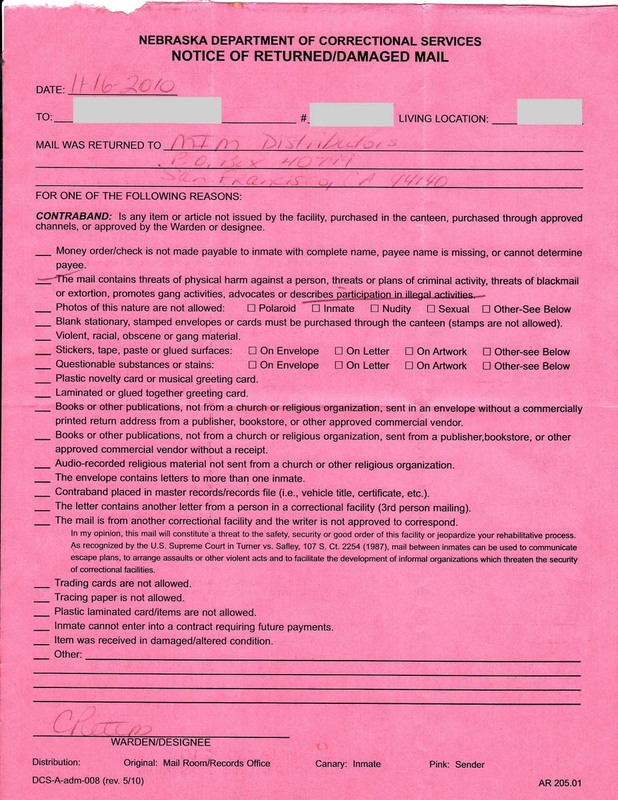 In July 2010 an invitation to a prisoner to join a study group was stamped "Contents Not Allowed" and returned, unopened. More recently, issues of Under Lock & Key issue 16 (September/October 2010) have been returned. 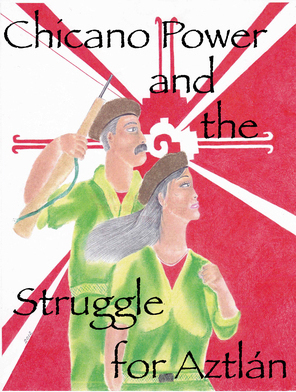 We also have received word that the following items are pending review: Maoism and the Black Panther Party (a pamphlet), MIM Theory 13: Revolutionary Culture (a magazine), and Under Lock & Key issue 12 (January 2010) (a newsletter). Please inform us of the status of these reviews. According to Ramirez v. Pugh, 379 F.3d 122, 126 (3d Cir. 2004), "prison walls do not form a barrier separating prison inmates from the protections of the Constitution." Based on the First Amendment rights of MIM Distributors and the prisoners who desire to correspond with MIM Distributors, I am making the following requests: (1) explanations of the censorship of all mail from MIM Distributors, listed above, (2) an appeal for a second opinion regarding the censorship of the items listed above, including Under Lock & Key issues 15 and 16, and (3) immediate cessation of illegal handling of mail from MIM Distributors to prisoners at Foothills CI, including compliance with the NC DOC notification policies to sender and recipient of intercepted mail. If you have other information about additional mail that is being censored coming from MIM Distributors, please inform us of its status. I appreciate your effort in investigating this matter and your timely response. 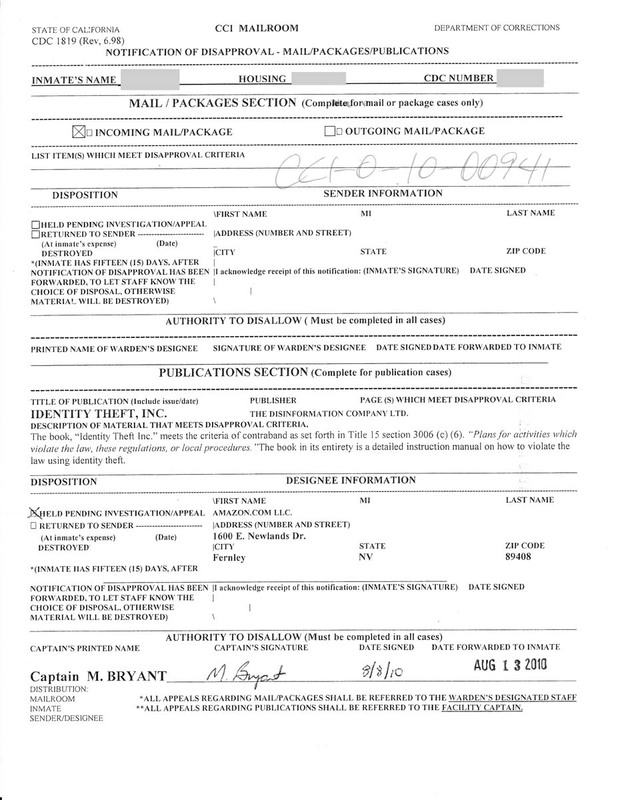 Since 2007 MIM Distributors has sent many articles of mail to prisoners held at Perry Correctional Institution. Generally we receive some indication from the prisoners we correspond with that they have gotten mail from us. 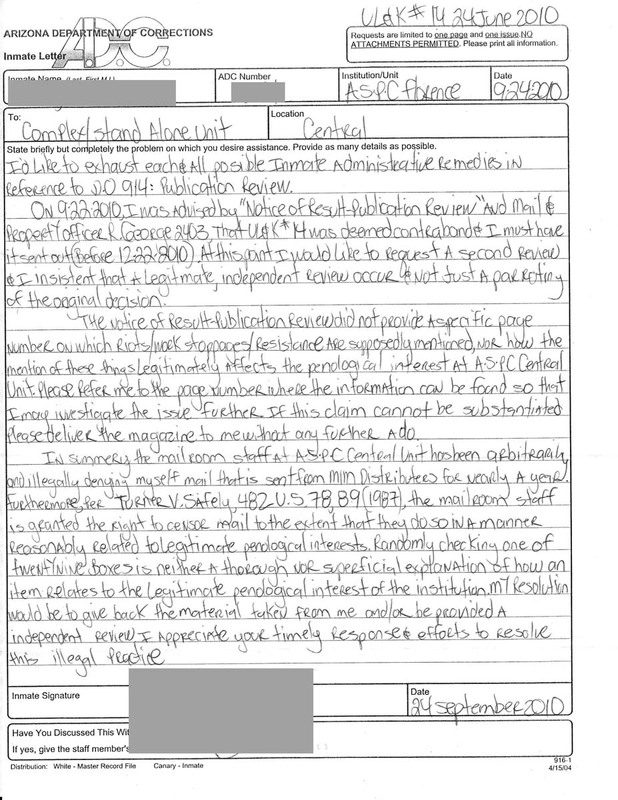 However, we have never received this confirmation from prisoners at Perry CI, and in fact many prisoners have written to us repeatedly asking to be put on our mailing list, indicating that they have never received mail from MIM Distributors. MIM Distributors has sent in the newsletter titled Under Lock & Key as well as many letters to prisoners at Perry CI. 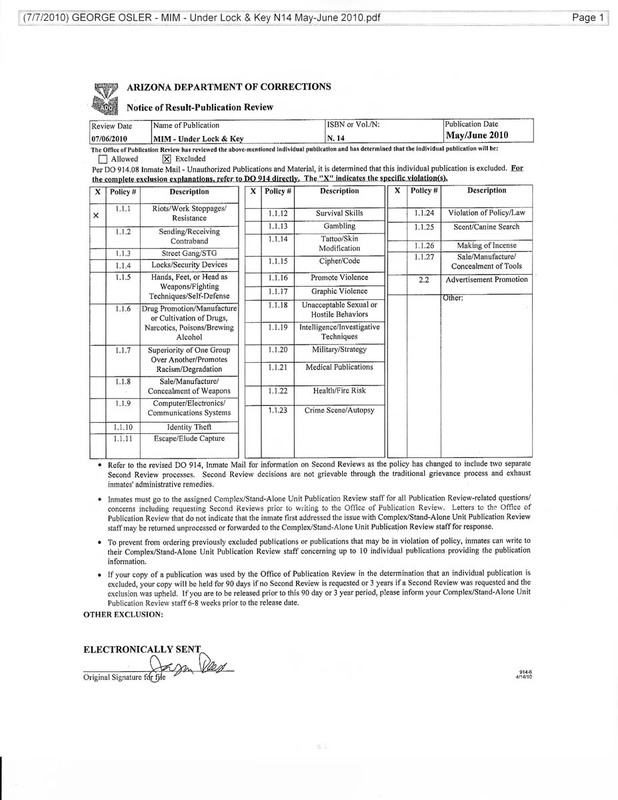 MIM Distributors has only once received notification from the mailroom staff at Perry CI that our mail would not be delivered to its intended recipients. However, according to United States law, as set in Procunier v. Martinez, 416 U.S.396. 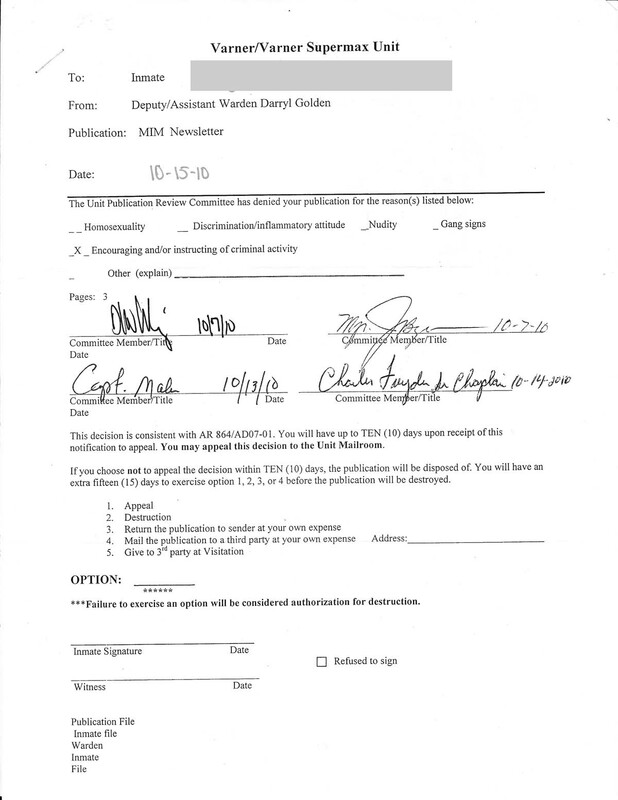 94 S.Ct 1800, "The court required that an inmate be notified of the rejection of correspondence and that the author of the correspondence be allowed to protest the decision and secure review by a prison official other than the original censor." 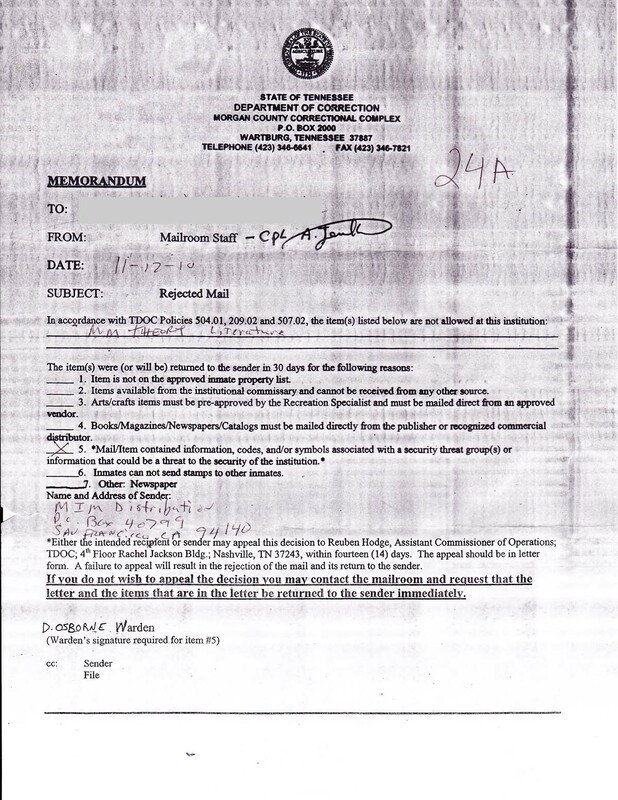 Except for this single piece of returned mail, the mailroom staff have not been notifying MIM Distributors of their decision to censor our mail. 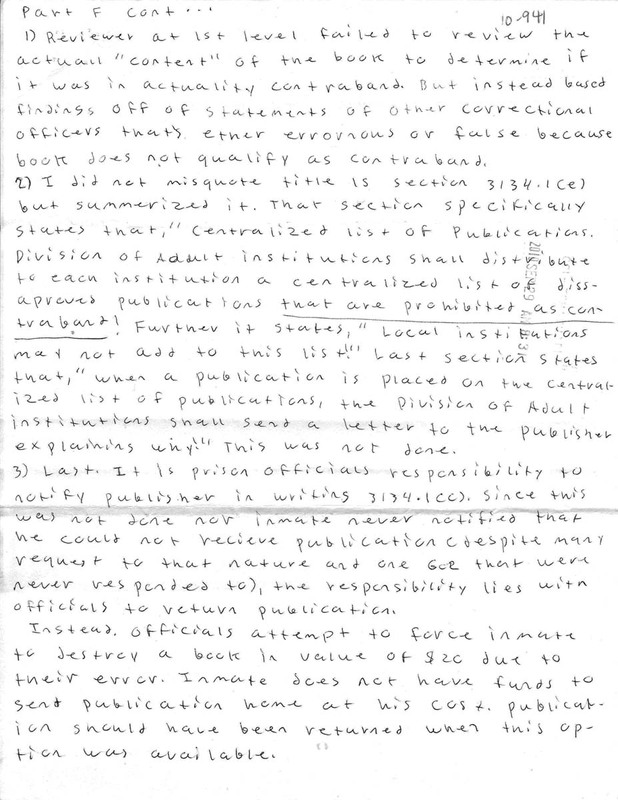 Based on the mail we've received from prisoners at Perry CI, they are also not being notified of this censorship. This is a completely illegal practice of your mailroom staff. 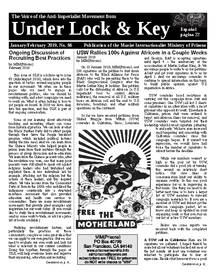 The article of mail that was recently censored was issue 16 of the newsletter Under Lock & Key, which is published and distributed by MIM Distributors. 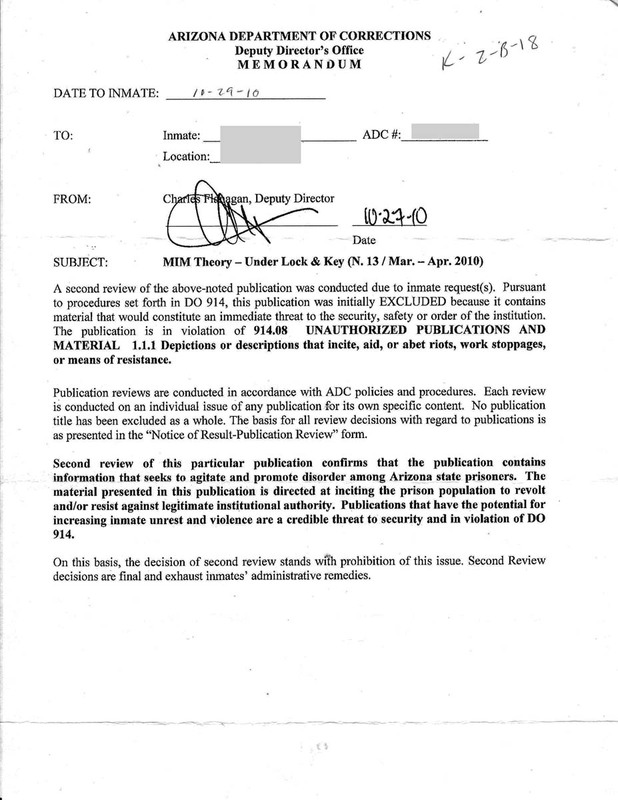 The reason given for this denial was that there are to be "no periodicals on lock-up unit," (see the attached paper, a copy of the "rejection notice"). As you probably well know, according to United States law, "when a prison regulation restricts a prisoner's First Amendment right to free speech, it is valid only if it is related to legitimate penological interests," per Turner v. Safely, 482 U.S. 78, 89 (1987). What is the penological interest that is being used to uphold this policy that no periodicals should be allowed on the lock-up unit? 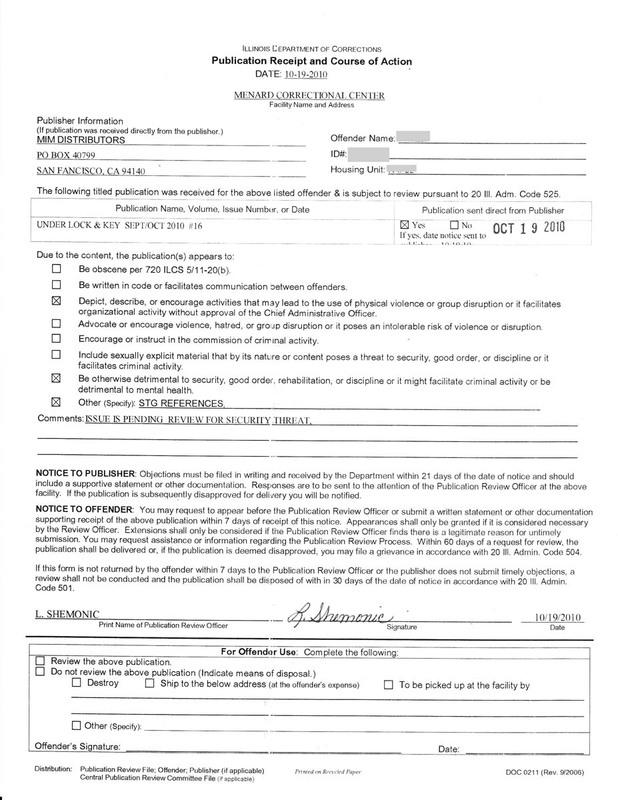 In addition to requesting (1) that your mailroom staff start notifying senders and intended recipients of decisions to censor incoming mail, in accordance with U.S. law, (2) an explanation of the penological interests behind the policy that no periodicals should be allowed at Perry CI, I am requesting (3) the mail rules for Perry CI and (4) any other information you may have regarding the censorship of mail from MIM Distributors to prisoners held at Perry CI. 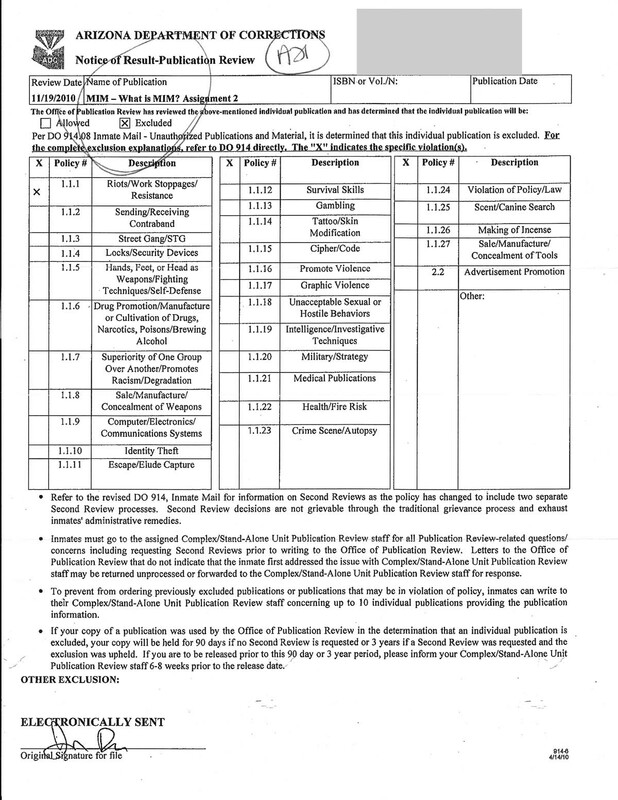 ULK 13 had p7 and 8 removed because "promotes and encourages hunger strikes" (prisoner requested staff remove the content). 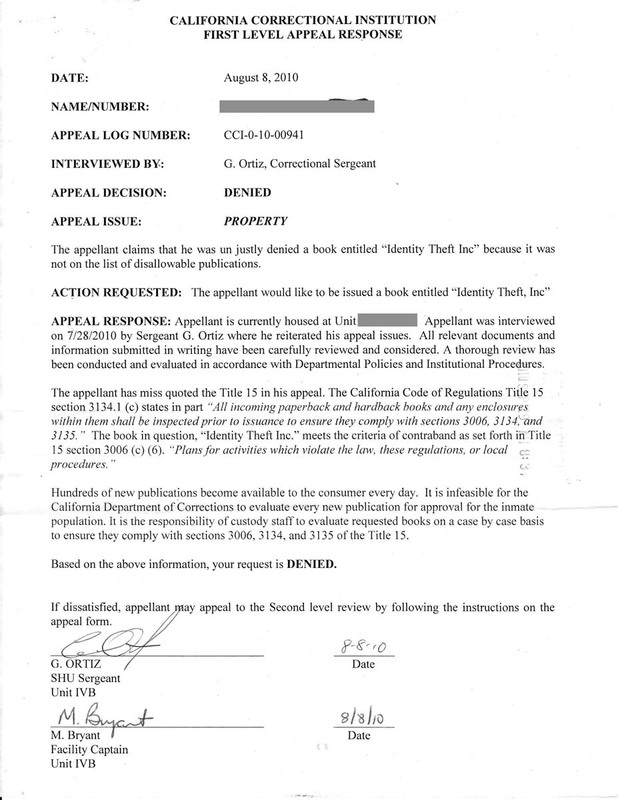 Denied, based on Title 15 (c)(6) "Plans for activities which violate the law, these regulations, or local procedures." This book is not allowed. Review at 1st level failed to address several issues of appeal (see attached).